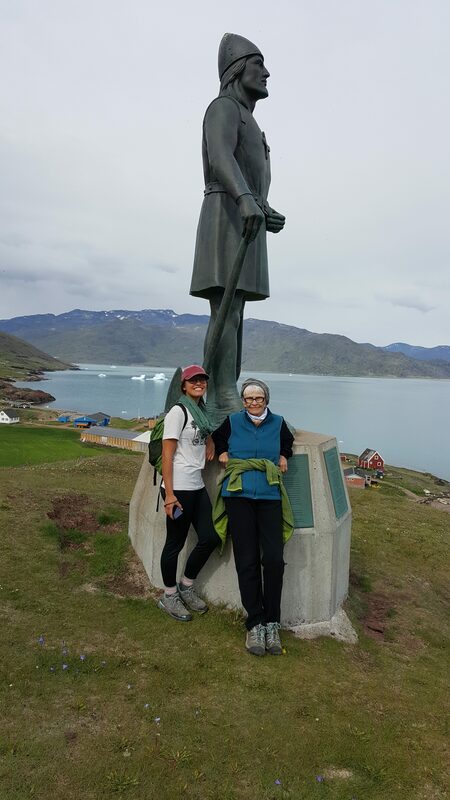 TERESA AND I WITH GREAT (X 10 OR 20) GRANDFATHER LEIF IN GREENLAND. “Ancestry” has been referenced in many of my posts. Here’s the quick and simple version of exactly what it is and how I’m using it to add both breadth and depth to my summer trip to Norway. Ancestry.com is a website that connects us with our extended—multiple generations extended —families. This is how it works for me. 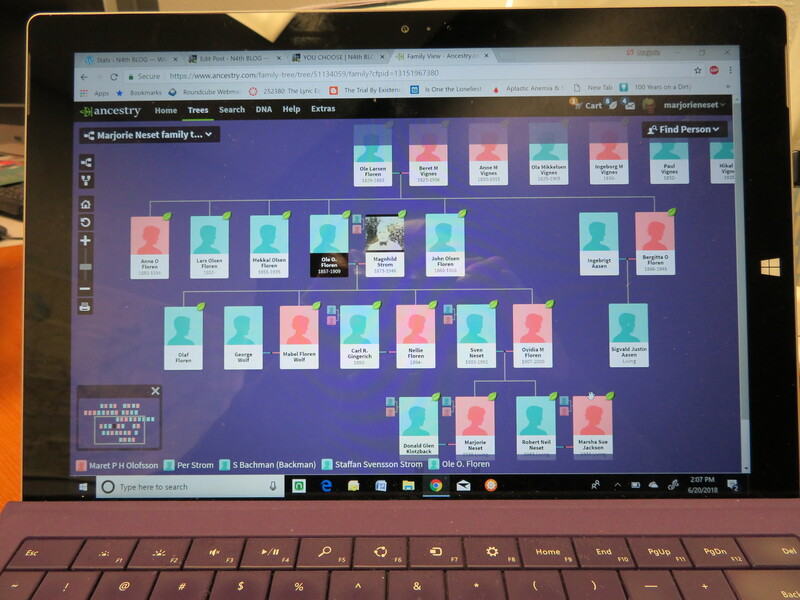 I first joined in order to access their family tree maker and start the process of building my own family tree with me at the center, all my forefathers and mothers branching out above. It all begins by plugging in information you have about any relatives, as close as your parents to as far back as you can go. As you enter the names, birthdates and places, and any other information available into the ‘tree’ format provided, hints will come from other trees also registered on Ancestry which have the same names/birthdates and so forth in their trees. Sometimes the hints are relevant, sometimes not, but as you enter the new information into your tree, it grows, each new hint something to build upon. Family trees are an interesting visual although, in a way, an upside-down concept. They build upon me, the tree maker, with branches sprouting as more and more ancestors are identified—making the greenest of new branches older than the trunk. See what I mean—upside down. My next step was doing the DNA testing which consists of sending some spit off in the mail and waiting for an email confirming who you thought you were—or, in some cases, surprising you with who you are not. 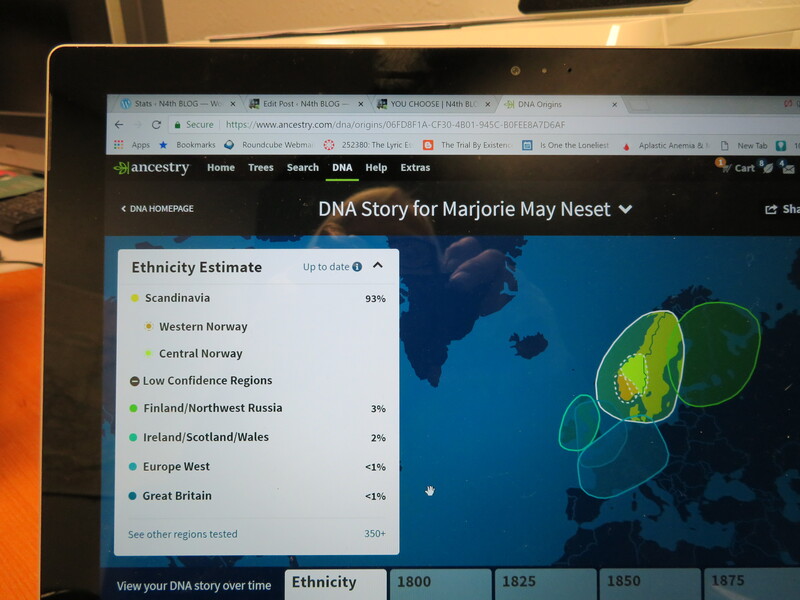 At first it was only to see if any unexpected ancestors showed up in the bloodlines since I believed myself to be 100% Scandinavian. Well yes and no. Ninety-three percent Scandinavian indeed, but those Viking forays around the neighborhood showed up as well in 3% Russian, 2% Irish, and a couple of percentage points for Britain and Northern Europe. Although I am extremely proud of and fascinated by my Norwegianness, it might have been fun to have a sprinkling of some darker (or at least rarer…) genes coursing through my bloodstream, but I’ll happily settle for representing almost the whole of Viking territory to some small degree. .
An amazing thing happened when the results of the test came back. In my Ancestry account a list of cousins appeared…many cousins…cousins galore. There were a few second-third cousins but mostly fourth-sixth cousins. My sixth cousin and I would be related through the generation of our great-great-great-great grandparents (I think!). It’s complicated. Here all these years my impression has been that I’m from a fairly small family. Now, it turns out I’m from the most extended of families; we all are if we just go back a few generations. I wonder why this pleases me so. Did I feel deprived of cousins? True, I’m only close to a few of them, and that does not include the beautiful talented mean one who was a pathological liar—but I digress. Anyway that seemed sufficient until now…when I just want to know more and more about the tracks and trails of my DNA.